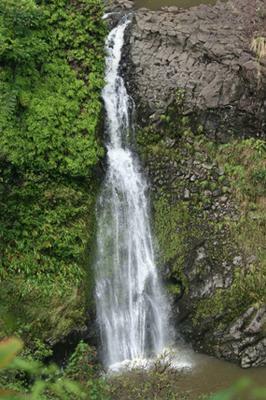 Being in Maui some time ago I drove along the wonderful Hana Highway. I’m a waterfall lover and specially appreciated the large amount of them I found there. But there’s one, which picture is included, I couldn’t identify. It’s between Upper Waikani and Lower Wailuaiki ones and can be seen at the left side from the downward road but not easily: you must look at the right place and at the right time, since I only discovered it just the next moment after leaving it behind. Then I had to keep on driving down the road to find a safe place to park, to walk up again till the point from which I saw it, and then after a short hike I had a full sight of the waterfall as in the picture. But I’ve been unable to put it a name. First I thought it was Lower Waikani but ruled it out when I learnt it only can be seen in the distance from the town of Wailua. It’s impossible that I was the first and only person to discover it so close to the road. Then I considered the chance of being a possible “Middle” Wailuaiki, since it’is closer to Wailuaiki than to Waikani, but although I heard something about it I’m not sure at all that such “Middle” tier really exists. Maybe with this information plus the waterfall picture you can help me to know which one it is. Thanks a lot in advance.